When you want to create portraits of subjects at night on your EOS 6D with this mode, the shutter stays open long enough to capture detail in the background as well. This means you’ll have to mount your camera on a tripod to compensate for slow shutter speed. You’ll also need to use a Canon flash. The burst of light from the flash is what captures a sharp image. Press the Mode Lock button and then select SCN from the Mode Dial. Press the Quick Control button. The Quick Control menu for the SCN modes is displayed. If you have photographed with a SCN mode before, the last used mode is displayed on the Quick Control menu. Press Set to display all of the SCN mode icons. 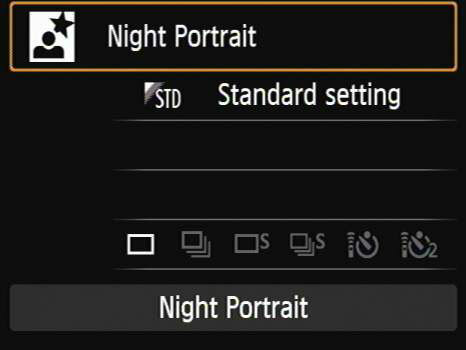 Use the Multi-controller to select the Night Portrait mode and then press Set. When you photograph in this mode, the camera captures images in the JPEG format with Large image quality. This mode uses the Standard setting for picture ambience, and the drive mode is Single Shot. You can change a setting by highlighting it with the Multi-controller dial, pressing Set, and then choosing the desired setting. There is no option to change the lighting setting. Compose your image and then press the Shutter button halfway to achieve focus. When you photograph in this mode, you generally want to show some of the background to give the viewer a sense of the place where the portrait was photographed. Therefore your subject should be on one side of the frame. Make sure you place the center autofocus point over your subject to achieve focus. Then with the shutter button still pressed halfway, move the camera to achieve the desired composition. Press the Shutter button fully to take the picture. Because the shutter will remain open after the flash fires, ask your subject to remain still so the portrait will not be blurred. It’s also advisable to use a tripod when photographing with this SCN mode. If you don’t have a tripod handy, place your camera on a flat surface and then use the 2-Second Countdown Timer. The two-second delay gives the camera time to stabilize from any vibration that may have occurred when you pressed the Shutter button.